But better late than never is what they say, so today I made my favorite Sugar Cookie Cut Outs. I can remember making these when I was a young girl living in Illinois. We had this little table in the kitchen that jutted out, kind of like a breakfast bar would do, but not as tall. 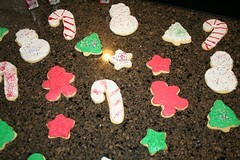 It was perfect for little people like me and my sister to sit down at and frost these cookies. I honestly don’t know what recipe my mom used for the dough. I must not have been involved in that end of it. 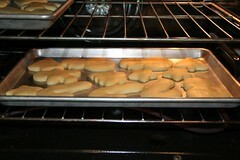 But after a few hours in the refrigerator she would bring it out and let us help her with the cookie cutters. We’d make all kinds of shapes and sizes. She’d bake them and then it was time for the real fun to begin. Mom used to make her own icing. I go for the store bought variety. 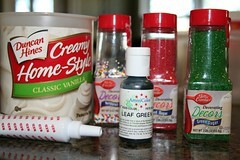 One tub of white frosting, food coloring, and misc sprinkles. 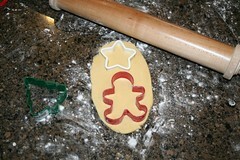 There was a time when I got into the intricate details of the cookies. Like using cookies cutters for stockings that have toys in them and trying to frost it to look like a stocking with toys in it. Not anymore! Time is of the essence for me now! Now they are not so fancy, but they are still very good. 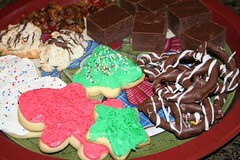 And they are pretty on the cookies trays that I will be taking to my neighbors later tonight. Thank you Cyndy, for hosting the exchange!!! I haven’t done a cookie exchange in a few years, but I’m impressed at your cookies! I don’t do the fancy stuff any more. Just give me a cake box and some chocolate chips and I make some really yummy cookies. They’re also great for making cookies in a jar. Our favorite teacher gift! Thanks for coming to my party! I think sugar cookie cut-outs are so fun. My SIL gave me a box of 100 different cookie cutters, all seasons, numbers 0-9 and the alphabet. Very fun! BTW you DO NOT sound old!